Dr. Donian Shen explains how bone grafting can be used to restore jaw strength, allowing patients with bone loss to use dental implants to replace missing teeth. Mountain View, CA — According to Mountain View dentist Donian Shen, DDS, missing teeth are not only a cosmetic concern, but also a condition that can lead to bone loss and functional problems in the long-term. She explains that one of the most popular and recommended treatments for missing teeth, dental implants, requires adequate bone structure to be effective. While many patients will have the necessary bone density, she says patients who desire dental implants and lack this feature may not be ideal candidates for the procedure. Bone grafting, Dr. Shen indicates, often can help individuals achieve sufficient bone density for dental implants. Bone grafting is a surgical technique that is designed to rebuild the jawbone. Dr. Shen says that patients who lack adequate bone structure for implants can utilize bone grafts to reconstruct the jaw. She adds that bone grafts can come from many places, including the patient’s body, a donor, or an animal, depending on the needs and preferences of the individual. According to Dr. Shen, some patients may also need soft tissue grafts, in the event other oral structures are damaged or deficient. 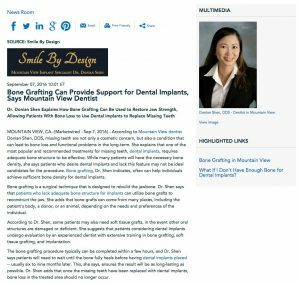 She suggests that patients considering dental implants undergo evaluation by an experienced dentist with extensive training in bone grafting, soft tissue grafting, and implantation. The bone grafting procedure typically can be completed within a few hours, and Dr. Shen says patients will need to wait until the bone fully heals before having dental implants placed—usually six to nine months later. This, she says, ensures the result will be as long-lasting as possible. Dr. Shen adds that once the missing teeth have been replaced with dental implants, bone loss in the treated area should no longer occur. A Fellow of the International Congress of Oral Implantologists (FICOI), Dr. Donian Shen is a general, cosmetic, and restorative dentist in the San Jose, Palo Alto, and Mountain View area. She earned her Doctor of Dental Surgery degree from the University of California, Los Angeles School of Dentistry before completing additional training in dental implants, bone grafting, and soft tissue grafting at the Carl Misch Institute. Dedicated to continuing education, she has also completed training in oral conscious and IV sedation. Dr. Shen is a member of the American Academy of Cosmetic Dentistry and the American Dental Association. She is available for interview upon request.